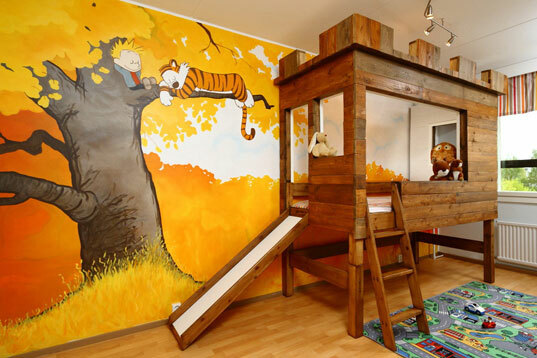 Awesome Dad Builds His Son a Calvin & Hobbes Nursery with a Tree Fort Bed! Fantastical treehouse bunks and playbeds make our hearts skip a beat, and when we laid eyes on this amazingly designed Calvin & Hobbes themed nursery a dad built for his young son, we were beyond impressed by his labor of love. Made in Finland, the designer/dad, along with his sister, constructed a loft bed that’s more like an indoor tree fort. This space would be any kid’s dream come true. It makes us want to turn back the clock to be a kid again — and sleep in that super cool bed and then whiz down the cleverly attached slide to greet each new morning with glee. Continue on after the jump to see a tour of this sweet nursery. Lastenhuone from Jarkko Vertanen / Visimo on Vimeo. Best pals Calvin & Hobbes are lost in a happy dream while perched on a tree branch, and stuffed woodland animals sit atop the bed, overlooking the whimsical locale. It’s clear why the little boy who calls this room home is absolutely jumping for joy in the video above. We’re giddy just getting a glimpse at the darling world he inhabits. Fantastical treehouse bunks and playbeds make our hearts skip a beat, and when we laid eyes on this amazingly designed Calvin & Hobbes themed nursery a dad built for his young son, we were beyond impressed by his labor of love. Made in Finland, the designer/dad, along with his sister, constructed a loft bed that's more like an indoor tree fort. This space would be any kid's dream come true. It makes us want to turn back the clock to be a kid again -- and sleep in that super cool bed and then whiz down the cleverly attached slide to greet each new morning with glee. Continue on after the jump to see a tour of this sweet nursery.